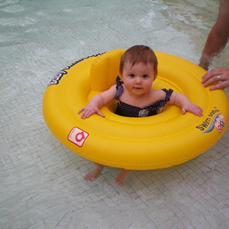 During my pregnancy with Alice, there was one thing I couldn’t wait to do and that was taking my baby girl swimming. There were a couple of reasons for this, firstly my mum can’t swim and hates the water and as children she made sure that my brother and I loved the water and learnt to swim. She would put aside her own fear and take us swimming and I love her for doing this. Secondly, in the future when we go on family holidays I want my children to be happy and confident in the water. I started taking Alice for swimming lessons when she was 14 weeks old and we have been going every week (apart from a break when I had Holly). I also, started Holly’s lessons when she was 13 weeks old, this was more of a challenge, arranging childcare for Alice and Holly’s routine. It was totally worth it, both my girls love their weekly lessons. To see Alice now able to swim for half a length completely on her own is so wonderful to see. Holly started off a bit unsure about it all, she didn’t cry, but she has gradually got better over the weeks and now loves it. 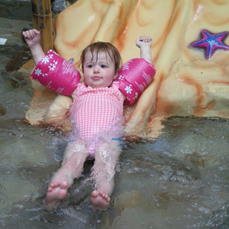 Number one…Most swimming pools are nice and warm (it’s worth checking this before you go), but for little ones they can get cold after a very short time in the water. I use either a baby swimming wrap or wetsuit to keep them warm. I also, use a cuddle dry towel with a hood, to wrap them up in afterwards. Number two…Dress them (and you) in easy clothes, I find trying to put tights on my girls a struggle. Something that is quick and easy, you don’t want to be fiddling with difficult buttons or poppers. In the summer, the fewer clothes you can get away with the better. I wear flip-flops for most of the year, its just so easy when you are nearly done and they are itching to leave! Number three…If you can afford to take them to lessons, I would recommend it. They not only teach your little ones, they teach you how to handle them in the water and can give you confidence to take them on your own. Lessons can make a great present from a loved one, when they ask you what your child would like for christmas or birthday. Number four…Enjoy it, it is a great way to bond with your little one, they will be looking at you for reassurance. So, even if you are nervous, try not to show it. There is nothing better than seeing your little one achieve something that you have taught them. Number five…Swimming makes them hungry, if they are not on solids, plan to feed them before you get in car. If they are on solids, take a snack. I usually have some raisins and this keeps them occupied whilst I quickly throw on my clothes. Not a tip, but an added bonus…Enjoy the naps afterwards! 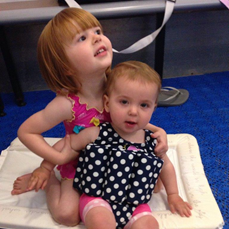 Swimming makes little ones tired and my girls would have a lovely long nap after swimming. To be honest taking both my girls to swimming lessons every week, on different days, was tough on me. Having to get all my swimming stuff washed, juggling childcare for the other, panicking would I get back in time to pick Alice up from preschool. But I didn’t want to stop, so I was really pleased when I was able to move both their lessons to a Saturday morning and they are back to back. My husband comes with us and he gets them ready for the lesson and then dresses them afterwards and they get to watch each other in their lesson and so does daddy, which they love. It’s become a lovely part of our weekend that we can do together. I hope this has been helpful and don’t hesitate it’s a lovely experience.